Mix flour and powdered sugar together, then pour the butter over the dry ingredients. Mix together gently, until just crumbly. Lightly spray a 9 x 13″ casserole pan (metal with straight sides is best for this) with cooking spray, and then press the crumbs firmly into the pan in an even-ish layer. I like to leave little bumps from my fingers- gives it a rustic texture, but you can do whatever you want. (I also like a thick crust, so if you like it thinner, don’t use all the mix, or make two pans) Bake for 15 minutes at 350. In bowl (I use the same one I made the crust in, just rinsed out) whip the six eggs with a whisk until they are uniform and light. Add the sugar, baking powder and flour, and stir to combine well. With a microplane or small grater, zest only the outer yellow skin from two of your fresh, washed lemons. Probably about 2 Tablespoons. Add tot he egg/sugar mixture. 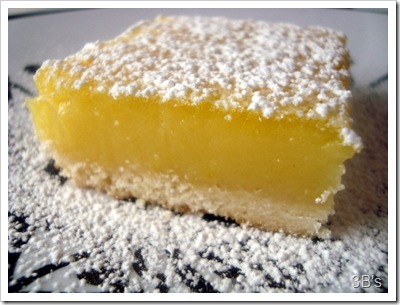 Squeeze the lemons, straining out the pips and pulp, and add the 1/3 cup of juice. After 15 minutes, pull the crust from the oven, and immediately pour the curd mixture over the hot crust, scraping the bowl to get all the lemony goodness. Pop it back in the over for 45 minutes, or until set and it doesn’t jiggle in the center. Let cool COMPLETELY (it will be a mess if you rush it, trust me!) before slicing into neat squares. Dust with powdered sugar, and watch your knees give out as you taste them. This is one of the foods I miss most from before gluten and my histamines got in a land war. It’s Here! In My Hot Little Hands! My book! Okay, well, it’s not MY book- but ten pages of it are mine! I’ve been reading all afternoon, and wow! it’s sooooo weird to read something published with your name. I’ve been writing regularly for more than five years- and I like to think I’ve put out some decent writing. Not all of it, by a longshot, but some pieces make me proud. This is just really different. There is something about holding a book in your hands that’s another world from looking at a screen. Of course you all already know I’m a sentimental sap and love the smell of books anyway. It was always a hidden dream in the back of my closet to actually DO this. And here it is, folded open in my lap. I can see now why writers always thank their editors. Writing for publishing is like having a child- (hyperbole, I know!) but it’s apt. And you don’t want to cut out your words- this is where an editor is merciful and doesn’t have the emotional attachment to the word-children, and can pare it down, make you sound better, where you own vision is clouded. I’m really grateful, and I can already see where I would re-tool it if I could. Not to say it’s not good- it is. I’m pleased to have my name on it. Tickled pink, actually! 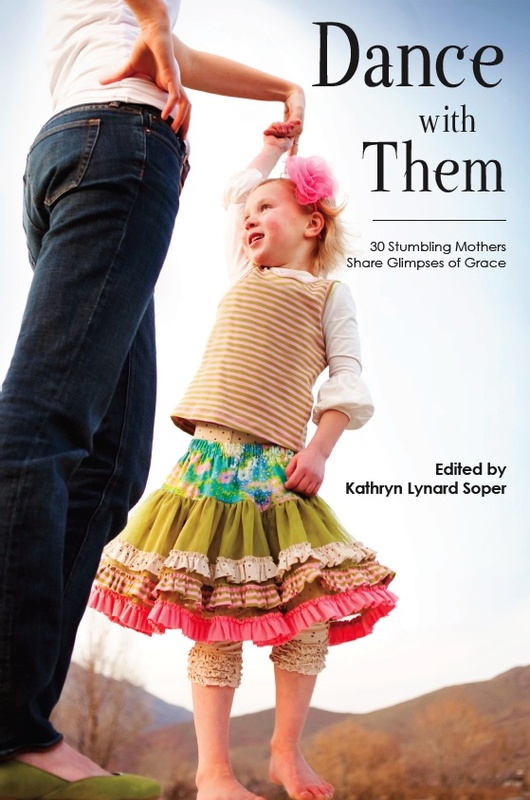 So if you feel like it, are looking for a summer read, click on the book cover in the right sidebar, and order yours today. They’re shipping now. I’m so happy! I think this officially moves us from “fans” into FanGeeks. 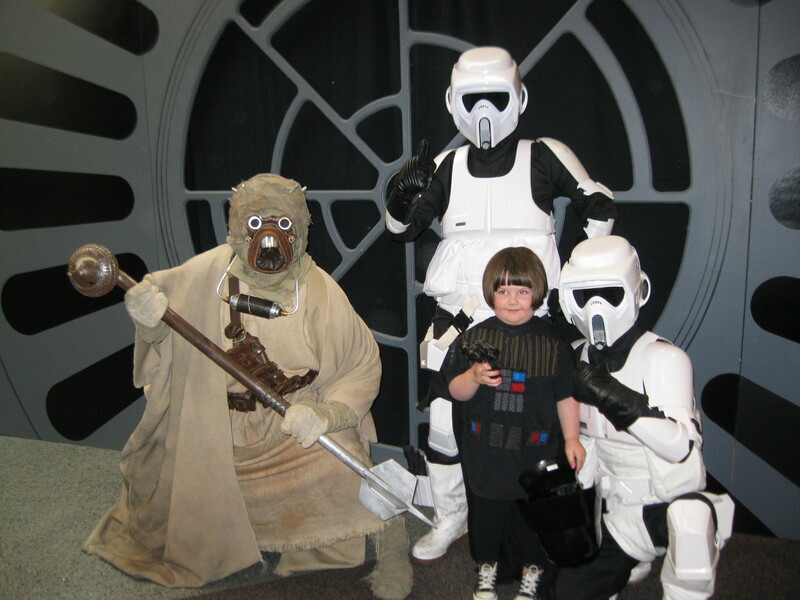 I took the kids to Comicon 2010 today, and Abby went in full Vader regalia. These other Fans actually asked to have their picture made with her- and they weren’t the only one. 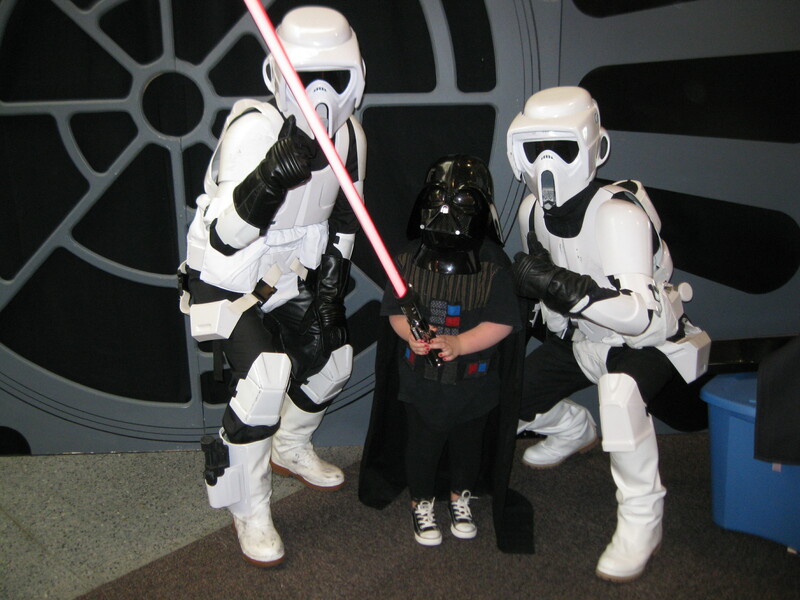 She got serious hi-fives and props for being the ONLY four-year old and ONLY girl dressed as Lord Vader. People thought it was awesome. Mostly because IT IS! Then the Tuscan Raider wanted to get in on the Girl Vader action. She was very proud. 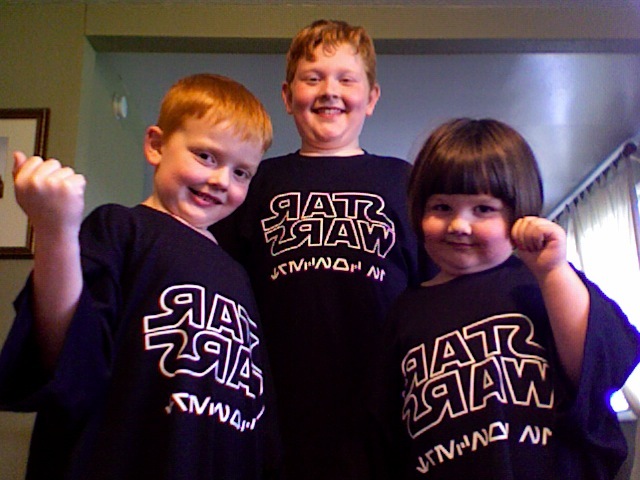 Someone even kicked down and gave us all Star Wars t-shirts after they took her picture. For FREE! Because my four-year old has a following now. Mo will have to explain what all this means. I have no desire whatsoever to see the new Twilight movie. Ditto MacGrubber. Burger King sells big bags of ice at their drivethru for a buck. Like. 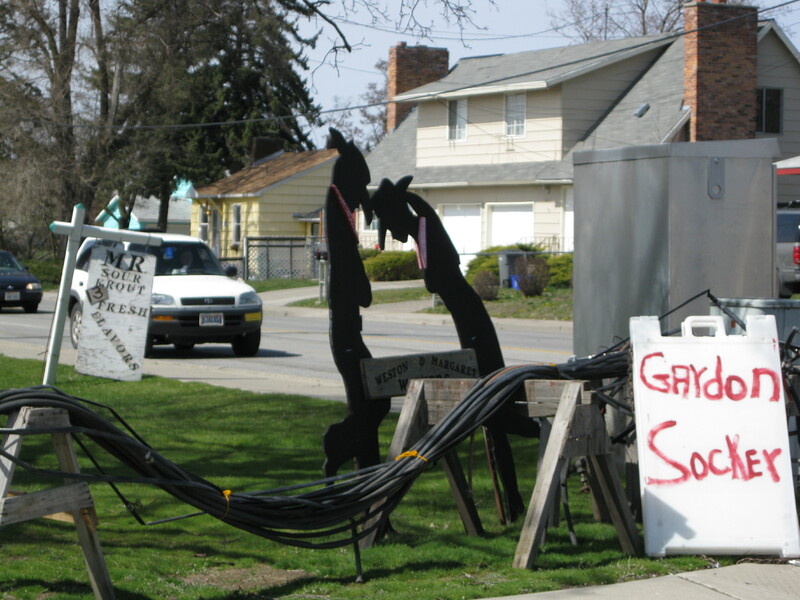 Hoping the weather holds so I can have a yard sale on Saturday. It’s storming like mad tonight. I dug out a flashlight, just in case. I just watched all of Firefly on Hulu. Lurves me some Joss. I’ve dropped six sizes in pants. It’s awesome. Did you know when you lose weight, your feet shrink? Also awesome. School starts in a few weeks, and I forgot how much books cost. Holy. Cow. Helped a friend pack her house to move this morning. Payback. The Eternal Laundry cycle has really got me bugged. I miss my mom. And my brothers. And the rest of my family. I can’t think beyond right now. If I do I will panic. So I don’t. Am reading a book by Billy Graham on angels. Interesting. Different. Adam and Jamie are mythbusting the guy on the slide flying into the plastic pool. Mo is moving, and I don’t want to talk about it. My brain feels stuck in the shallows right now, and I can’t say I’m enjoying it. I can’t decide- backpack or messenger bag for college? The corner of my front yard is flooded, and I don’t know why. Sigh. So, um… I’ve been picked up for distribution by Pedersen-Arne for my quilt patterns. They are a national distribution wholesale house for quilt stores. They only optioned for four of the twenty-four available patterns, but they’ve reordered already on the ones they did choose- before they even got the first shipment. I’m kind of tickled about this… it makes me happy. It also gives me hope. 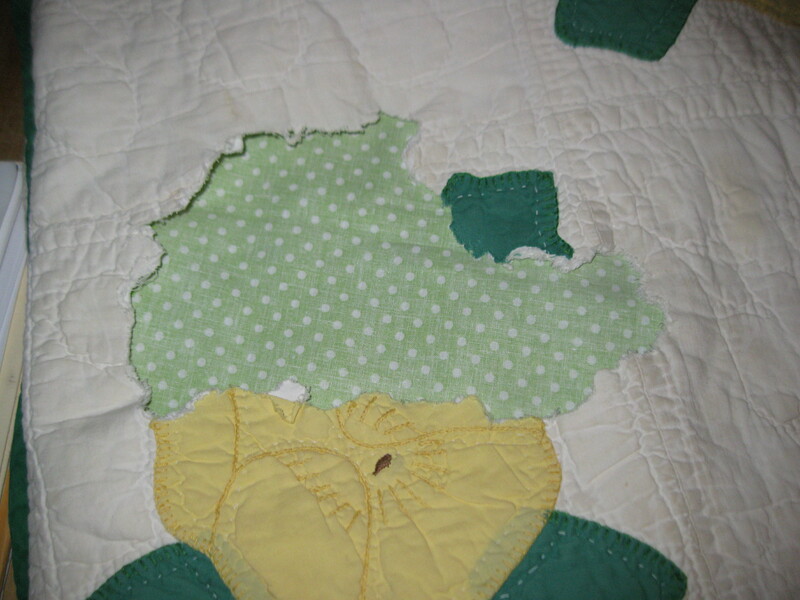 A few weeks ago, a friend contacted me and asked if I ever repaired damaged quilts. I never have, but I know quilts, am a confident sewer, and told her I would look and see what I thought. Me and my big mouth. A few days later, a package arrived on my doorstep with the damaged quilt. 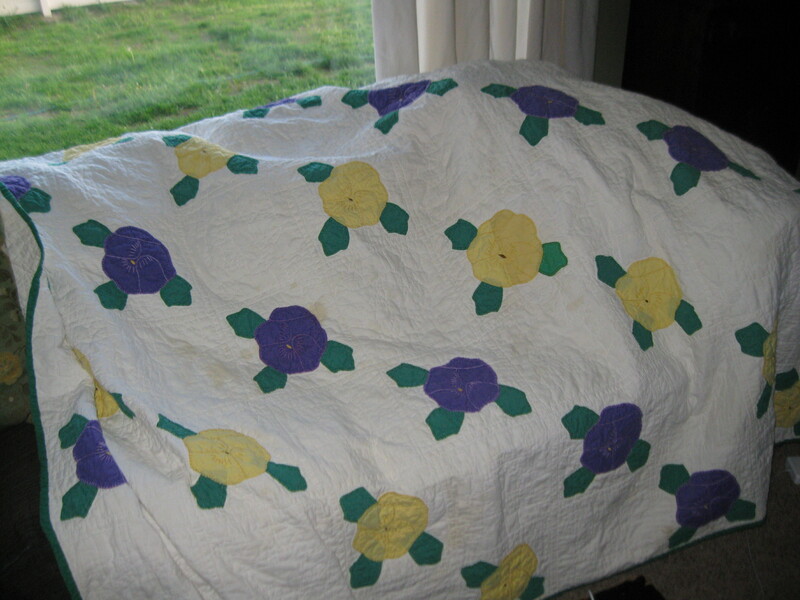 It was a beautiful white cotton quilt, with appliques of yellow and purple pansies arranged diagonally. Right smack in the middle was a huge hole. No back, no batting, no front. Just hole. How do you repair where there is no fabric? Where there is nothing to even stitch with or to? Don’t ever tell me I can’t do something. That is the hole. The green polka-dot fabric is not the backing- I stuck it behind just so you can see the hole. It’s about eight inches of gaping missing-ness of quilt. 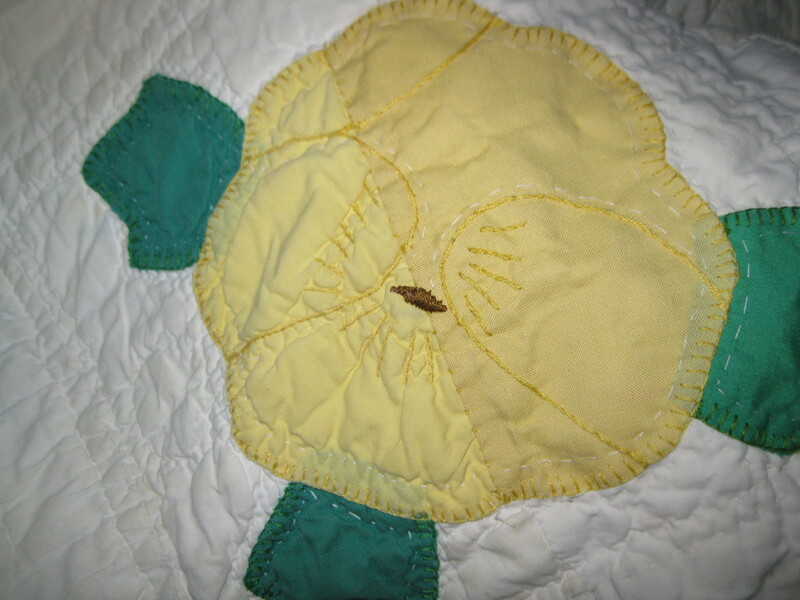 Add to that the fact that this a vintage quilt, and the threads and colors were faded and fragile. I had my work cut out for me. Har har har. See what I did there? *snort* Can you tell I haven’t slept much lately? What was I saying…? So my first job was figuring out how to even give myself something to sew. I figured I should patch the back first, then I would have a way to insert new batt, and then worry about re-piecing the front. Okay. Plan en force. Every single white fabric I have was GLARINGLY white against the mellow patina of the old cotton. Crap. Then I got a brilliant idea- I have a thing for old pillowcases- can’t pass them up at yard sales or thrift stores. I covet and treasure them- and they are almost always white. And old. And have a patina of old cotton. Bingo! I riffled through my linens and found a perfect match. Here you can see the white patch. It’s organic shaped on the front to preserve as much of the original as possible. You can see the yellows are not a perfect match, and the green is a little bright- but this was the very best I could find. This kind of work has to be entirely done by hand- If someone’s figured out how to restore textiles with a machine, I want to know about it. The original was all hand done, and the restoration had to be as well. 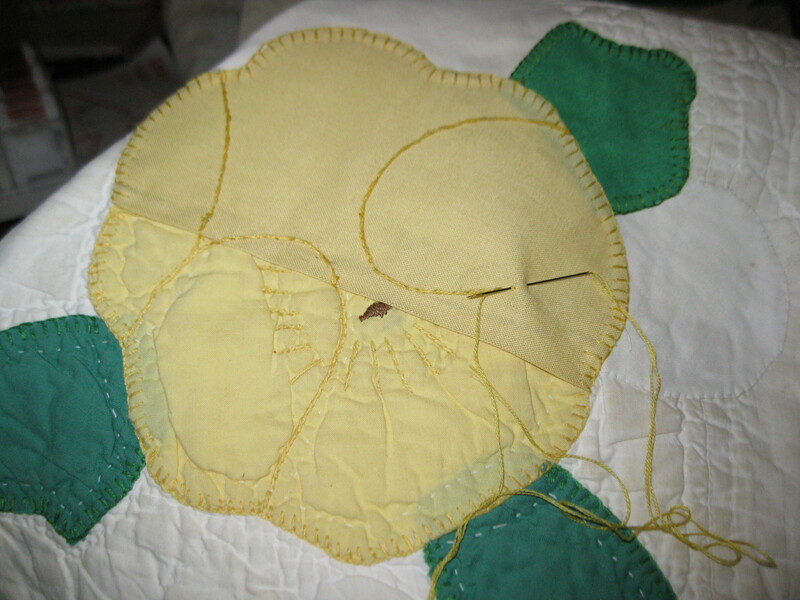 Here I’m adding the details to the pansy with a double-strand stem stitch. 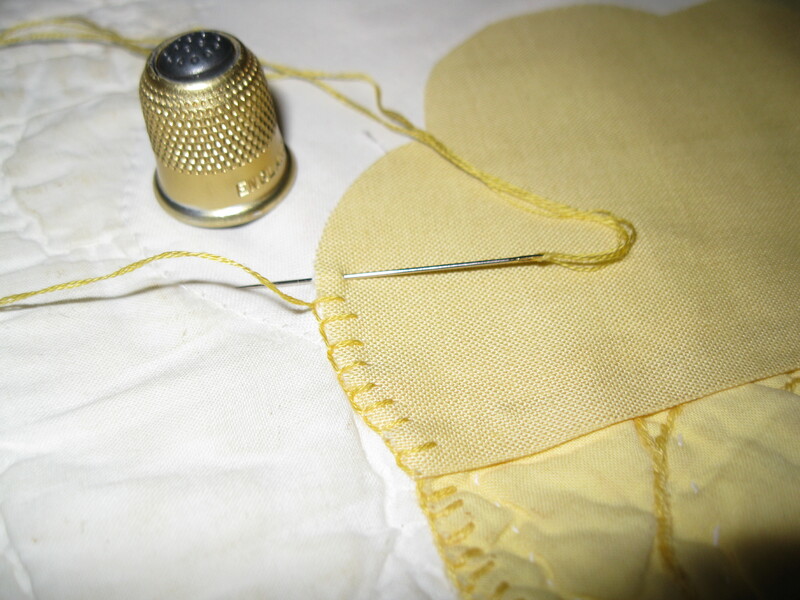 I love this stitch, but a thimble is a necessity. 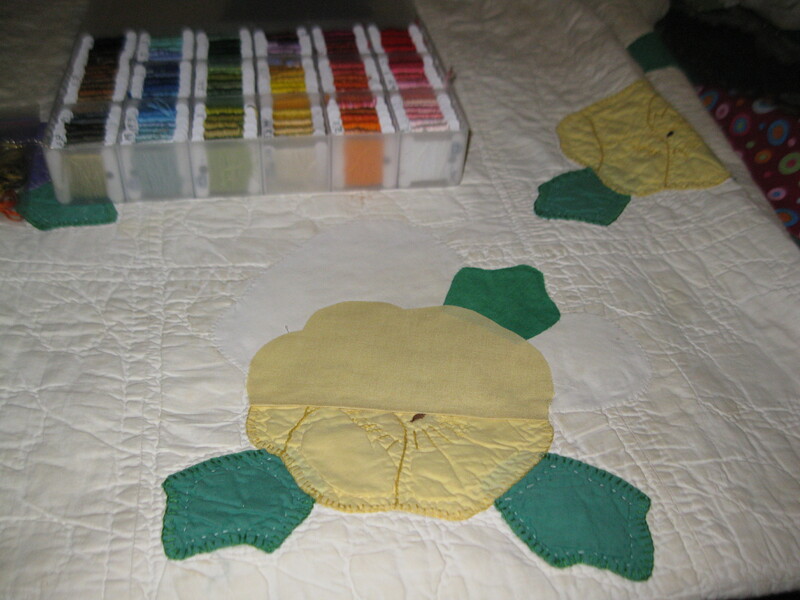 The original quilter also left her basting stitches intact for the applique, so I had to add those as well. The I had to hand quilt the white background patch so it would match and pick up the design on the original. One that was done, I handwashed it with cold water, and ran it through the dryer on low. The warmth of the dryer further puckered the new fabric, making it blend in better with the old. Hand quilting helps this process too. It’s not perfect- but it’s really good. And it can be used and loved now, and the original is still almost entirely preserved. This was a fun way to try something new and add some skills to my toolbox. And now, you’ll have to excuse me while I go finish a bunch more projects that have been languishing on my backburners. I have a kajillion loose ends to wrap before school starts next month.